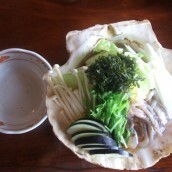 This is a shallow-fried half kamo-nasu with sweetened miso paste on it. 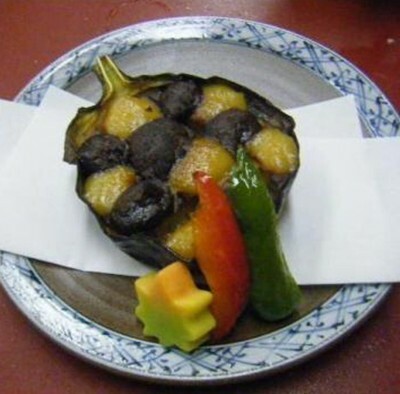 “kamo-nasu” is a fat rounded eggplant which is a popular summer vegetable originated in Kamigamo and Nishikamo area in Kyoto. 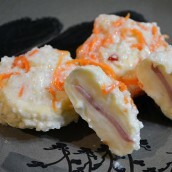 This eggplant is famous for its fleshy texture and juiciness. 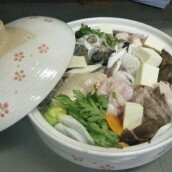 “ kamonasu-no-dengaku” is a dish that makes the most of the kamo-nasu. 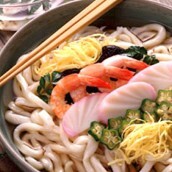 This dish is served from early July, and often served at traditional Japanese restaurants during Gion-festival in July.